Today’s post poses a question about a serial link, and what you can know – for sure – based on the figure and some show command output. As usual, the question is below the fold, with the answer posted in a few days! Ask questions if you have them. You have just been ushered into a small conference room to begin an interview. The interviewer, Scott, got called away just as he was about to start asking questions. The marker board lists some network documentation, and some additional paper notes sit on the conference room table. Scott tells you that it’s ok to read over what’s there while he finishes what is hopefully a short call. The board shows the following figure, along with a note that this small network has been built using real gear in the next conference room. One page of documentation shows the output of the show interfaces s0/0/0 command on router R1. 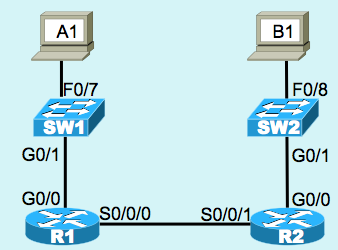 However, the documentation shows nothing about router R2. Additionally, above the figure on the board, the words “This figure is correct (Scott)!” are written. So, if you take the figure and command output as both being correct, which of the following answers lists items that you can know are true for sure? Do not choose answers that may be true, but are not for sure true.